On our California to Oregon road trip John and I had a fantastic dinner at Leroy’s Kitchen and Lounge in San Diego. The highlight of the meal, for me, was definitely the quinoa fried rice. I took one bite and said out loud: “I’m totally making this at home when we get back!” Well, here it is. The first step is to prep the tofu. You could throw it into the pot as is with the veggies but I like a really nice sear on my tofu so I grilled it first. There’s better flavor and texture that way. Get a grill pan or saute pan screaming hot over high heat. 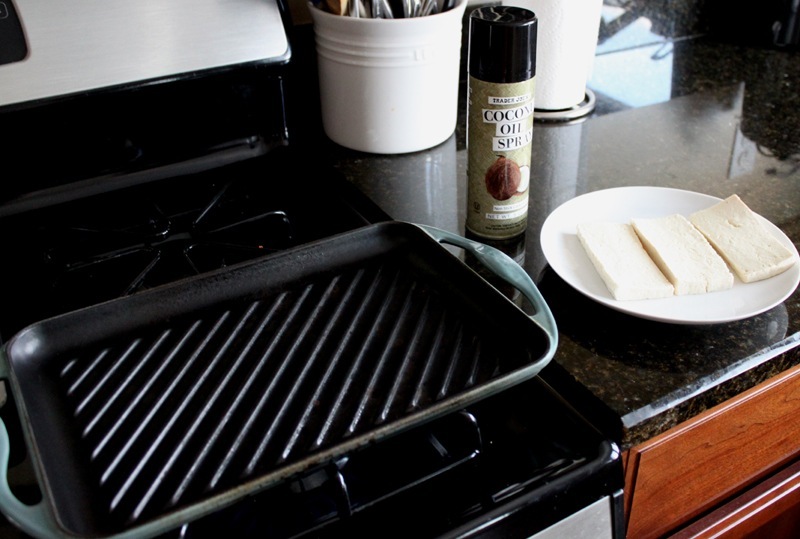 Spray down with a non-stick spray (I’m loving Trader Joe’s Coconut Oil Spray for this) and place the tofu down gently. Grill for 1-2 minutes, or until you get those great grill marks, and then flip and do the same on the opposite side. When it’s done, set aside to cool. 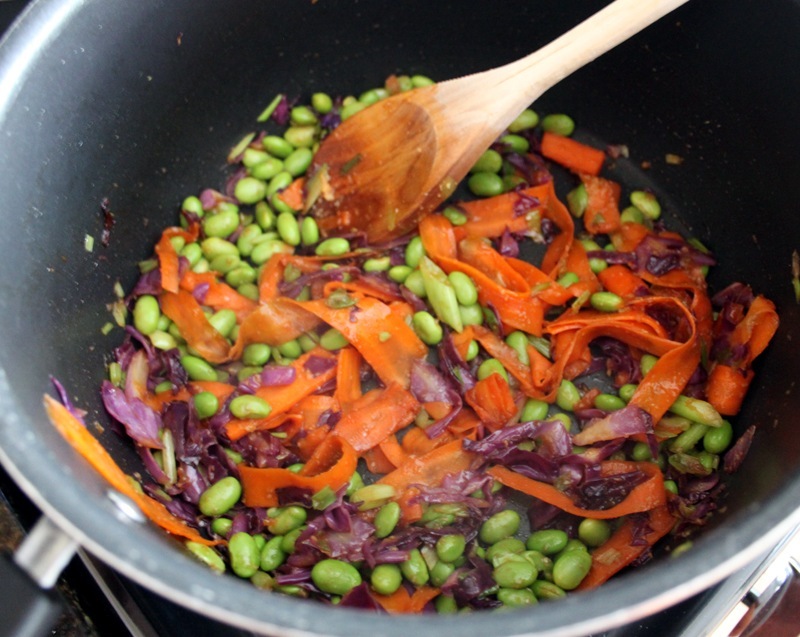 In a medium sized pot, saute up the cabbage, carrots, shallots, and edamame with the coconut oil over medium heat. Cook until the veggies are tender (about 4-6 minutes). 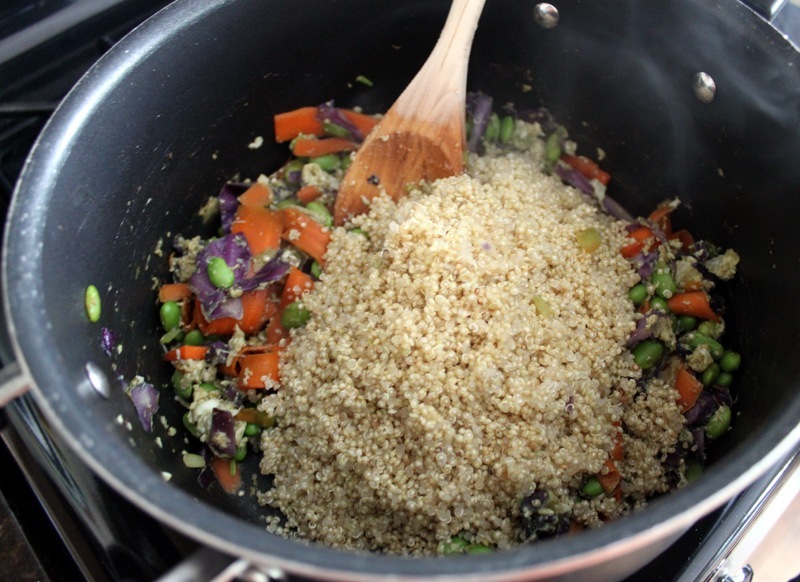 When the veggies are done, stir in the cooked quinoa. I cooked this separately in a small pot while I grilled the tofu. At this point cube up the tofu and toss it in the pot too. The final steps are to add the hoisin, soy sauce, salt and pepper all to your taste preferences. Cook that all together for another minute or two. Serve up in two big bowls and garnish with the green onions. The possibilities for this dish are endless. 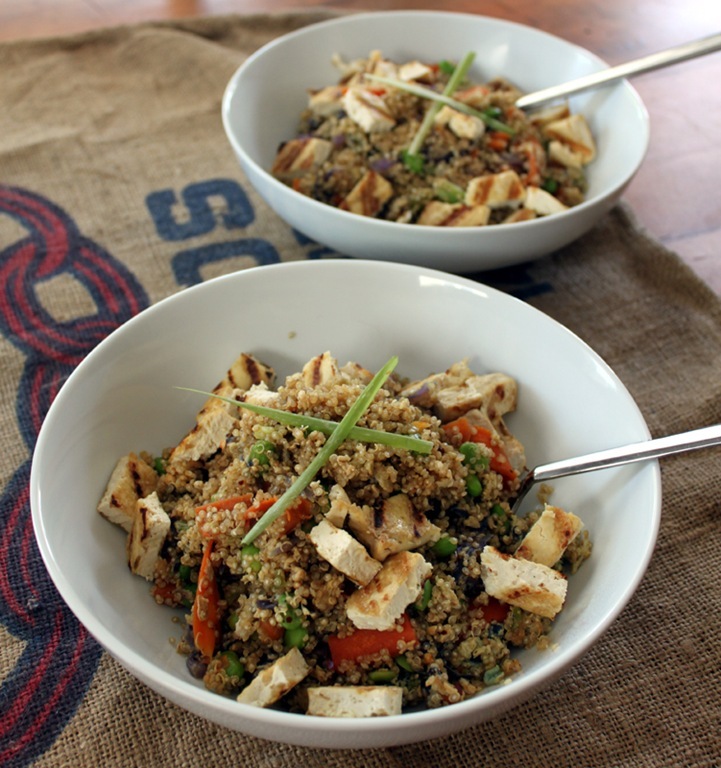 Other optional good things to add would be red peppers, an egg, red chili flake, sesame seeds – anything really! That looks great, I’ll try it! Thanks, you should – it was really good! Looks good, but I try to stay away from soy products in general! 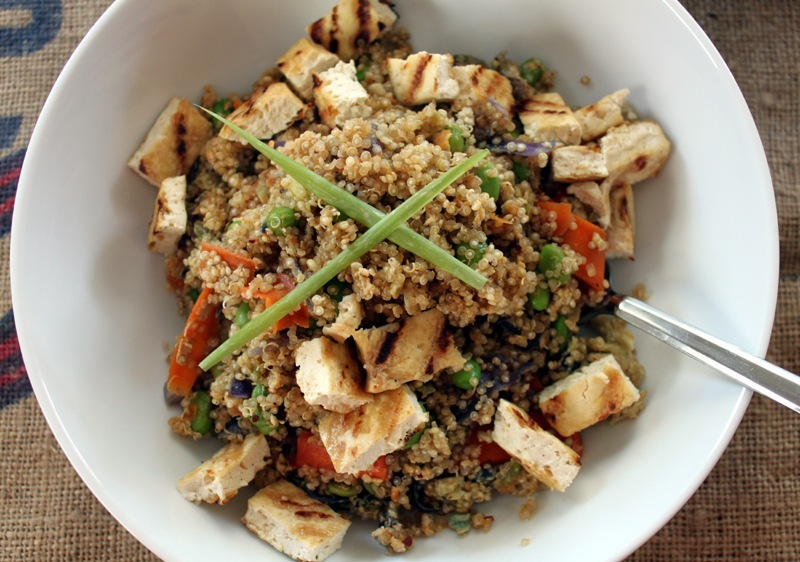 And quinoa is cool in small amounts but it’s super carby! 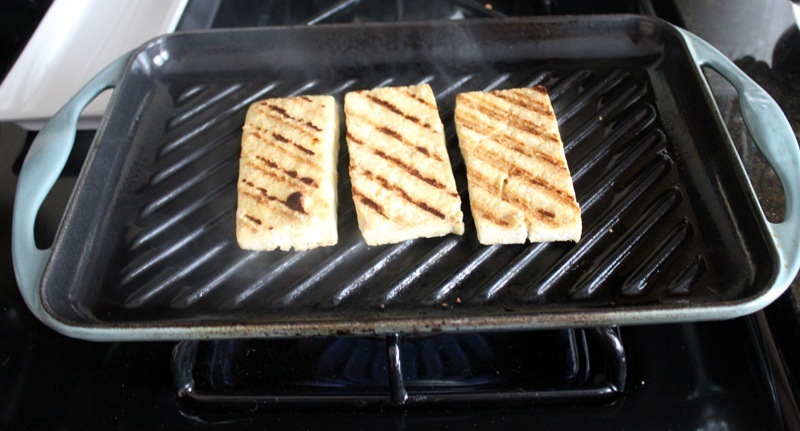 I’m totally jelly of your sweet grill marked tofu. Do you guys have a grill pan? You must get one! The texture is so much better grilled.